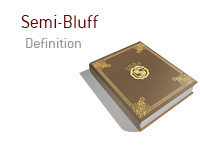 What does the term "semi-bluff" mean? What is the definition of the term "semi-bluff" in poker? A "semi-bluff" occurs when you bet after the flop or turn with the hope that you are not called. However, if you are called, you have outs that could give you the best hand by the river. You are dealt 3h-5h in the big blind. Action folds around to the button, who put in a standard raise. The SB folds, and you make the call in order to defend your big blind. The flop comes 4d-6h-Ks. You have a big straight draw. You check, the button bets, you re-raise and the button calls. The turn brings the Qc. You lead out with a bet this time, and the button calls. Your straight draw is well-disguised thanks to your "semi-bluff" - the button likely thinks that you have a King in your hand. The river brings the 7h, which is obviously a great card for your hand. You overbet the pot, your opponent pushes all-in after a bit of thought, and you snap call. Your opponent turns over Kh-Qh for top two pair, while you flip over your rivered straight. In this hand, you were behind your opponent on a couple of streets, but you disguised your hand with a "semi-bluff" and hit one of your outs on the river. You are dealt Ks-Qh in the BB. Action folds around to the button, who puts in a standard raise. The SB calls and you call. The flop comes Jh-7c-10s. This is a decent hand for you, as you have now flopped a big straight draw. The SB checks and you bet. The button calls, as does the SB. The turn brings the 6h. The SB checks, and you bet again - a semi-bluff, as you don't have a hand yet, but have plenty of outs. You are hoping that your two opponents fold, but it's not the end of the world if they don't, as you have outs. The button folds, as does the SB, and you take down the hand.